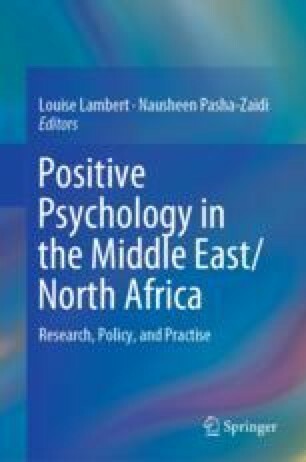 While positive psychology is a relatively new science, the notion of wellbeing itself is not novel and has always existed across all societies throughout history. In this chapter, we trace the origins of contemporary civilizations across the Middle East/North Africa (MENA) region from ancient (c. 9200 BCE) to modern times (2018 CE) and explore their notions of social and political wellbeing. The region’s past is characterized by remarkable intellectual and past social accomplishments, especially during the “Islamic Golden Age” (8th–14th centuries CE). Coming up to the modern era, we then highlight original data spanning the period of 1970–2011 to summarize the major drivers of the region’s social development and wellbeing as well as the challenges it confronts, particularly considering new political and military developments emerging in the region. ASDA’A Burson Marsteller. (2017). Arab Youth Survey 2017. Retrieved from http://arabyouthsurvey.com/findings.html. ASDA’A Burson Marsteller. (2018). Arab Youth Survey 2018: A decade of hopes & fears. Retrieved from http://arabyouthsurvey.com/findings.html. Albright, W. F. (2018). Ancient Middle East. Encyclopedia Britannica. Retrieved from https://www.britannica.com/place/ancient-Middle-East. Andrews, W. (2012). Mesopotamian religion and philosophy. Retrieved from https://prezi.com/nd1nvoawlud0/mesopotamian-religion-and-philosophy/. Arkenberg, J. S. (1998). Ancient history sourcebook: The advice of an Akkadian father to his son, c. 2200 BCE. Retrieved from https://sourcebooks.fordham.edu/halsall/ancient/2200akkad-father.asp/. Askari, H., Iqbal, Z., Krichene, N., & Mirakhor, A. (2014). Understanding development in an Islamic framework. Islamic Economic Studies, 22(1). Retrieved from https://ssrn.com/abstract=3158589. Baldawi, J. (2018). The status of women in Islam. Retrieved from http://islamswomen.com/articles/status_of_women_in_islam.php. Cuoto, R. A. (2010). The politics of terrorism: Power, legitimacy, and violence. Integral Review, 6(1), 1–20. Retrieved from http://integral-review.org/documents/Couto,%20Politics%20of%20Terrorism,%20Vol.%206%20No.%201.pdf. De Silver, D., & Masci, D. (2017, January 31). World’s Muslim population more widespread than you might think. Pew Research Center News. Retrieved from http://www.pewresearch.org/fact-tank/2017/01/31/worlds-muslim-population-more-widespread-than-you-might-think/. Estes, R. J., & Sirgy, M. J. (2018). Global advances in quality of life and wellbeing: Past, present, and future. Social Indicators Research. Retrieved from https://doi.org/10.1007/s11205-018-1869-4. Guzman, A. (2018). The role of women in Islam: The role of women in Islam is often misunderstood. Retrieved from http://www.beliefnet.com/faiths/islam/the-role-of-women-in-islam.aspx#D2YpXlLut2AIG0Qh.99. Ibn-Kathir. (1373/2013). Tafseer: The status of non-Muslims under Muslim rule (circa. 700 years after Mohammed). Retrieved from http://4freedoms.com/group/theology/forum/topics/the-status-of-non-muslims-under-muslim-rule. International Federation of Red Cross and Red Crescent Societies (IFRC). (2016). IFRC annual report, 2016. Retrieved from http://www.ifrc.org/. International Labour Organization (ILO). (2018). Statistics and data bases. Retrieved April 1, 2018, from http://www.ilo.org/global/statistics-and-databases/lang--en/index.htm. Ismail, A. G., & Haron, N. (2014). Happiness in economics as understood across Ism and religion. SAGE Open, 4(4). https://doi.org/10.1177/2158244014560543. Khan, S. (2018, February 4). MENA’s youth bulge is a regional security challenge. Retrieved from https://thearabweekly.com/menas-youth-bulge-regional-security-challenge. Lambert, W. G. (1990). Ancient Mesopotamian gods: Superstition, philosophy, theology. Revue de l’histoire des religions, 207–2, 115–130. English version: http://www.persee.fr/doc/rhr_0035-1423_1990_num_207_2_1735. Mark, J. J. (2012). The Egyptian afterlife and the feather of truth. Ancient History Encyclopedia. Retrieved from https://www.ancient.eu/article/42/. McKinsey. (2016, October). Digital Middle East: Transforming the region into a leading digital economy. Retrieved from https://www.mckinsey.com/global-themes/middle-east-and-africa/digital-middle-east-transforming-the-region-into-a-leading-digital-economy. Moore, J. (2014). The evolution of Islamic terrorism: An overview. Frontline USA. Retrieved March 6, 2018, from https://www.pbs.org/wgbh/pages/frontline/shows/target/etc/modern.html. New World Encyclopedia. (2018a). Sumerian civilization. Retrieved from http://www.newworldencyclopedia.org/entry/Sumerian_Civilization. New World Encyclopedia. (2018b). Cuneiform script. Retrieved from http://www.newworldencyclopedia.org/entry/Cuneiform_script. Organization of Islamic Cooperation (OIC). (2018). Homepage. Retrieved from https://www.oic-oci.org/. Pew Research Center. (2013). The world’s Muslims: Religion, politics and society. Washington: Pew Research Center’s Forum on Religion & Public Life. Retrieved from http://www.pewforum.org/2013/04/30/the-worlds-muslims-religion-politics-society-overview/. Riaz, M. N. (2015, December). Portrayal of positive psychological capital in Quran. Al-Idah, 31, 37–73. Retrieved from https://www.szic.pk/journal/dec2015/4.pdf. Schoch, R. (2018). The great sphinx of Egypt (at Giza). Retrieved from http://www.robertschoch.com/sphinx.html. Sirgy, M. J., Estes, R. J., & Rahtz, D. R. (2017). Combatting jihadist terrorism: A quality-of-life perspective. Journal of Applied Research in Quality of Life. https://doi.org/10.1007/s11482-017-9574-z. Sirgy, M. J., Joshanloo, M., & Estes, R. J. (2018). The global challenge of jihadist terrorism: A quality-of-life model. Social Indicators Research. https://doi.org/10.1007/s11205-017-1831-x. United Nations Department of Economic and Social Affairs (UNDESA). (2017). World population prospects, 2017. New York, NY: UNDESA, Population Division. Retrieved from https://esa.un.org/unpd/wpp/. United Nations Development Programme-Arab Human Development Report (UNDP-AHDR). (2002). Creating opportunities for future generations. Arab Human Development Report, 2002. New York, NY: UNDP. Retrieved from http://www.arab-hdr.org/publications/other/ahdr/ahdr2002e.pdf. United Nations Development Programme-Arab Human Development Report (UNDP-AHDR). (2016). Arab Human Development Report, 2016: Enabling youth to shape their own future key to progress on development and stability in Arab region. Retrieved from http://www.undp.org/content/undp/en/home/presscenter/pressreleases/2016/11/29/arab-human-development-report-2016-enabling-youth-to-shape-their-own-future-key-to-progress-on-development-and-stability-in-arab-region-.html. United Nations High Commissioner for Refugees (UNHCR). (2018). Data sources. Retrieved from http://www.unhcr.org/en-us/data.html. We are Social/Hootsuite. (2017). Digital in 2017 global overview. Retrieved from https://wearesocial.com/special-reports/digital-in-2017-global-overview. World Bank. (2018). World development report, 2018: Learning to realize education’s promise. Washington, USA: World Bank Group. Retrieved from http://hdl.handle.net/10986/28340.